MVSC in Veterinary Microbiology is a 2-year post graduate degree program, the minimum eligibility for which is Bachelor’s degree from a recognized institute or its equivalent exam. MVSC in Veterinary Microbiology includes microbial (bacterial, fungal, viral) diseases and maladies of trained and domesticated animals (companion animals, livestock, fur-bearing animals, poultry, game, and fish) that supply nourishment, other helpful items or fellowship.The course provides candidates with a great understanding in Immunology, Molecular Biology and Microbiology significant to the study of veterinary microbiology. Interested candidates can get admission in MVSC in Veterinary Microbiology on the premise of candidate’s performance in a relevant entrance exam, and ensuing round of counselling. The average tuition fee charged for the course in India ranges between INR 5000 to INR 5 Lacs for a span of 2 years. Such postgraduates are hired in capacities such as Veterinarian Assistant, Veterinarian Technician, Veterinary Physician, Veterinarian Food Inspection Specialist, Associate Veterinarian, Bacteriologist, Veterinary Business Associate, Biochemist, Veterinary Nutritionist, Biotechnologist, Clinical Data Analyst, Biomedical Scientist, Cell Biologist, Medical Marketing Executive, Product Executive, Product Manager, Area Sales Manager, Research Officer, Veterinary Products Sales Officer etc. The initial salary for these positions in government organizations varies from INR 10,000 to 50,000 per month and in the private sector the package varies from INR 2,00,000 to 10,00,000 per annum. Top Recruiting Companies Fuzen pharmaceuticals private limited, Nutricare Life science limited, ISCOMN, ABT industries, Wellcon Animal Health, FARM LIVES(PVT)LTD, Synotive Technologies (i) Pvt. Ltd., Blue Pebbles Pharma, Dar Alkhalaf Agriculture Studies and Consultation, Pelican Medicare Homoeovet, Ayurvet Ltd etc. Top Job Areas Veterinary Colleges & Universities, Animal Health Product Companies, Veterinary Hospitals, Diagnostic Labs, Research Labs etc. Top Job Positions Veterinarian Assistant, Veterinarian Technician, Veterinary Physician, Veterinarian Food Inspection Specialist, Associate Veterinarian, Bacteriologist, Veterinary Business Associate, Biochemist, Veterinary Nutritionist, Biotechnologist, Clinical Data Analyst, Biomedical Scientist, Cell Biologist, Medical Marketing Executive, Product Executive, Product Manager, Area Sales Manager, Research Officer, Veterinary Products Sales Officer etc. MVSC in Veterinary Microbiology: What is it all about? This program is specially designed for candidates who wish to enhance their understanding of the role of micro-organisms in animal health and their disease and gives a brilliant grounding in immunology, molecular biology, microbiology and epidemiology. These fields incorporate research, business, commerce, government and policy, a reference lab and diagnostic work, disease mapping and epidemiology, veterinary science, farming and cultivating especially animal production, wild and zoo animal education and conservation. The course joins the study and investigation of the theoretical establishments of, and academic ways to deal with, understanding the application and different practices of veterinary microbiology inside the contexts described above alongside the development of practical and research skills. Candidates who have the ability to diagnose the concerned ailment quickly and accurately through utilization of current strategies and want to develop efficient and economical preventive and diagnostic tools for the advantage of animal owners are appropriate to match for it. Candidates must have the ability to identifying, organizing, selecting and communicating information. MVSC in Veterinary Microbiology degree course helps to bring researchers on various Virological, Bacteriological, Mycological and Immunological diseases to anticipate and fight the existing dreadful and infectious diseases as well as to discover measures to prevent and control the developing disease c caused by the various microorganisms. Given below are some of the top institutes in India that offer the course. Given below are the minimum eligibility criteria which candidates interested in pursuing the course are required to fulfil, in order to be eligible to apply for the course. Admission in various veterinary colleges such as Bihar Veterinary College, Patna, Assam Agricultural University, Jorhat, Bombay Veterinary Science College, Mumbai, Birsa Agricultural University, Ranchi, College of Veterinary and Animal Sciences, Bikaner is depended upon the results obtained in the entrance test conducted by the concerned college. For admission to MVSC in Veterinary Microbiology course, an All India Entrance Examination is led by the Indian Council for Agricultural Research (ICAR). The competitors should have obtained at least 60%marks. There will be only one question paper in every major subject group consisting of objective type questions, multiple-choice and also cross-matching type questions. A semester- wise breakup of the course’s syllabus is tabulated below. In the current years, there has been huge demand for veterinary specialists in the field of veterinary science. Veterinarians can select to work with private and government veterinary hospitals, sheep and rabbit, farms related to poultry, animal husbandry clinics. Veterinary services are likewise required by the dairy research institutes. The rise of commercialization in veterinary industry worldwide businesses of food developed, investigation, pharmacy and vaccine production is offering various career opportunities for the Veterinary professionals. 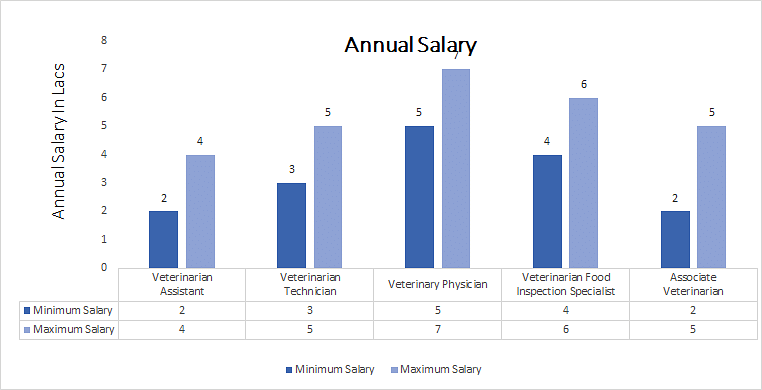 There are career options for the veterinary specialist by starting National talent scholarship, pay package, internship payment at an upper rate, junior and senior ICAR fellowships etc.